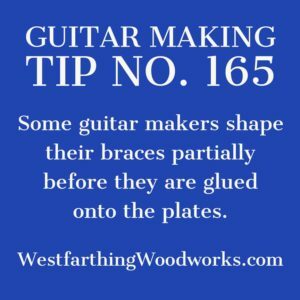 Guitar Making Tip number 165 is about shaping the internal braces. If you are new to carving with a chisel, you can save yourself some time by shaping the braces partially before you glue them down. This will reduce the amount you have to carve. Here is how you do it. 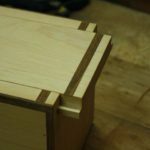 Every top needs a nice set of internal braces, and that means carving. As a new guitar maker, the carving process might be a little scary. This is normal, and there are a few ways around it. Carving the braces is largely a job for the chisel, and again this can be brand new territory as a new guitar maker. Something that you can do to make the process easier is to partially shape the braces before you glue them down. Using this method, you cut down on the amount of carving that needs to be done, and you get your internal braces off to a better start. 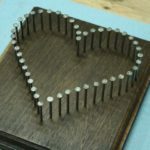 While you should feel encouraged to learn how to use the chisel as much as possible in the beginning, pre shaping the braces can cut down on a lot of carving. Especially since you are only going to be removing the excess waste, not finish carving off of the body. One of the best tools for the initial shaping is the band saw. This tool makes easy curved cuts, and can quickly remove material. Simply mark out the braces and then run them through the saw. Do this on all of the braces that you need to remove a lot of material from. Be sure that you don’t shape the sides of the braces though. You will still need to clamp them in place to glue them to the plates. Leaving the tops flat gives you somewhere for the clamp to grab. This makes the process easier, will less likelihood of a brace tipping. The benefits of pre shaping your braces are many. The first and the most obvious is the fact that you have to carve less in the end. Since the majority of the waste is gone, you only need to carve away the final shape and refine the profile, not the bulk. Second, pre shaped braces can be easier to glue in place. This is due to them not being as tall un-cut braces. The last thing you want is to clamp your guitar braces and have one of them tip over, which can happen in a case of uneven clamping pressure. Another benefit is speed. Sawing off the excess material is far faster than carving it off with a chisel. While speed should not be a focus for making decisions, it is worth mentioning that speed does improve when you cut away the excess from the braces before gluing. It’s just a fact that it is easier to shape the braces off of the plates. They are smaller, easier to move around, and easier to get into tight places. Working the braces this way gives you more freedom, and you can use more tools. If you were to try and take your braces to the belt sander while attached to the plate, it would be very hard. While they are not attached, the process becomes very easy. 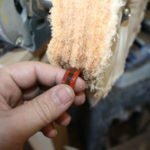 If you like how the sander removes material, you can now use it. Even final Sanding of the braces can be done off the plates, and now you can hold the braces in your hands while you do the work. This means an easier time, less weight, and most likely a faster sanding experience too. This can sound like craziness to some guitar makers that have been making guitars for a long time, but in reality nearly all manufacturers do this same thing. If you ever watch a guitar factory at work, you will see the braces go down in nearly finished condition. Some factories even put them down in completely finished condition, and never look back. There is no final adjustment, no last sound check, and nobody carving them to make the top the best it can be. The braces are made to the average, and on average they produce a guitar too that sounds good. Some worse, and some better. 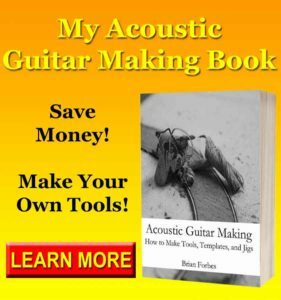 You can take this time saving tip and still put your own handmade quality touch on your acoustic guitar by simply going back and making sure you do a final check. 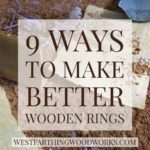 This means tapping the guitar top, refining the shape of the braces with a chisel, and then carefully sanding them until they are perfect. Your homework is to do a small amount of shaping of the braces prior to gluing them to the top of the guitar. If you are completely new to the concept, and you only want to dip your toe in the water, you can start with the back braces. The ends of the back plate braces are reduced quickly to the level of the board over the last couple inches on each end of the brace. This is a perfect candidate for the band saw, and you can knock out these ends very quickly. Once the pieces are glued down, go back with the chisel and refine the curves. The chisel will also remove the saw marks, making the brace ends look nicer. Carve the parabola shape next, and you get to try a little bit of both the shaping and the chisel work. If you like the process, then try it out on some of the top braces. Who knows, you may end up doing a lot of the shaping off the guitar in the future. Most manufacturers pre shape their braces at least a little before going them in place on their guitars. 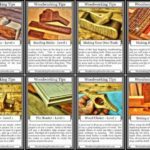 You can benefit from doing the same thing, and you can do as little or as much shaping as you like before gluing them on the plates. Mark out your patterns on the sides of the braces, and use a saw to remove the bulk of the waste from the sides. This will reduce the time you have to spend carving later in the process, as well as make it less chisel work in the beginning. 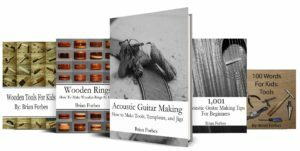 As you make more and more guitars, you will learn more about the chisel, as well as how you like to make things. You may end up doing more initial shaping, or less, and that will eventually become your own style.